After careful examination and treatment, we may advise you to have a tooth extracted. Before a tooth is removed, we will take an x-ray in order to understand the shape and position of the tooth and surrounding bone. Based on the degree of difficulty, we may refer you to a specialist called an oral surgeon, who may offer you the option of general anesthesia (sleeping), while you have the extraction. It is critical to keep the extraction area clean to prevent infection. 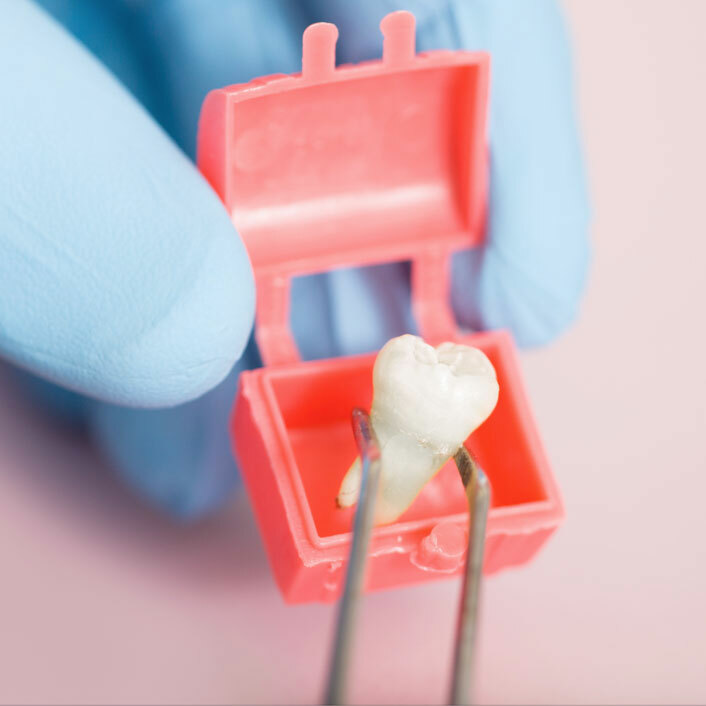 We will provide you with dry, sterile gauze to bite down on for 15 minutes to limit bleeding while clotting takes place. For the next 24 hours, you shouldn't smoke, rinse your mouth vigorously or brush teeth directly next to the extraction site. A certain amount of pain and discomfort is to be expected following an extraction, which can be minimized with a painkiller and ice packs applied to the face for 15 minutes at a time. After a routine extraction, discomfort should lessen within three days and taper off over the next few days. If you have prolonged or severe pain, swelling, bleeding or fever, call our office immediately. Wisdom teeth are the last molars, or “third molars” that develop on each side of the jaw. Wisdom teeth usually emerge in the back of the mouth between the ages of 16-20. Wisdom teeth are a valuable asset to the mouth when they are healthy and properly positioned. Often, however, problems develop that require their removal. When the jaw isn't large enough to accommodate wisdom teeth, they can become impacted (unable to come in or misaligned). Wisdom teeth may grow sideways, emerge only part way through the gum or remain trapped beneath the gum and bone. Most patients prefer to have sedation for wisdom teeth. We will provide the names of area Oral Surgeons. After the tooth (or teeth) is removed, you may be asked to bite down softly on a piece of gauze for 15 minutes after you leave the office, to limit any bleeding that may occur. Some pain and swelling may occur but it will normally go away after a few days; however, you should call us if you have prolonged or severe pain, swelling, bleeding or fever.